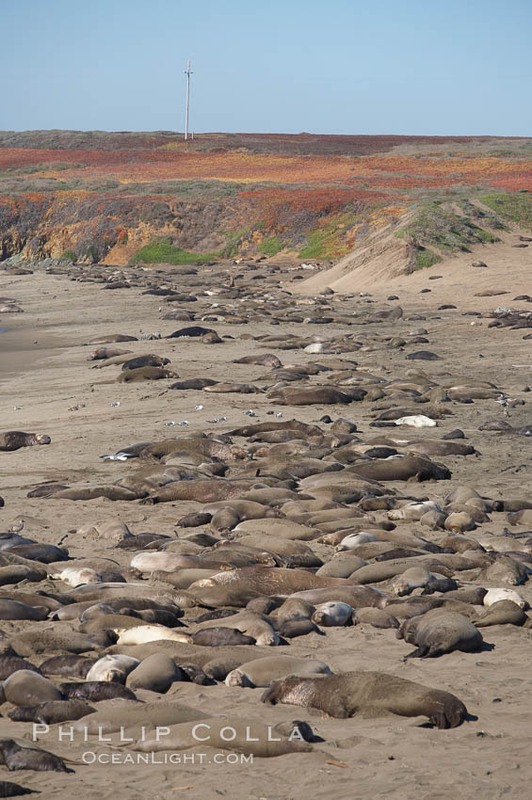 Here we see part of the burgeoning Piedras Blancas colony of northern elephant seals (Mirounga angustirostris) crowding the beach. In actuality this is about half of the animals that were here at the peak, a few weeks earlier. Many of the females have already weaned there pups (or lost them during the high waves that came in January) and have mated, and are now back at sea. Although Northern elephant seals are oceanic animals and as individuals spend the majority of their life at sea, as a population elephant seals utilize the Piedras Blancas colony nearly year round. There are two principal reasons elephant seals come ashore: molting (shedding their fur coat) and birthing/breeding. From April through August the elephant seals return to shore to molt, with females and juveniles molting first followed by subadult males and finally adult males. By August they are gone, back at sea with a new coat of a fur. In fall, immature animals will haul out to rest, younger animals appearing in September and older animals later. However, in general these immature elephant seals, typically weaners, yearlings and subadults, do not stay into the breeding season, generally leaving by late November to make way for the older animals.